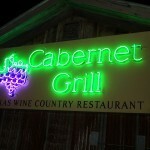 One of our favorite restaurants when we visit Fredericksburg is the Cabernet Grill. 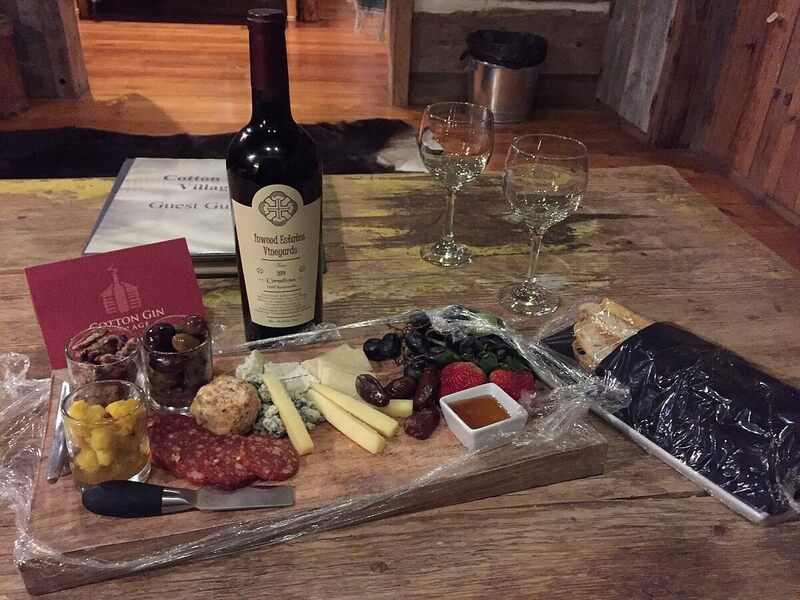 Great food and an all Texas wine menu provides a great evening of dining. 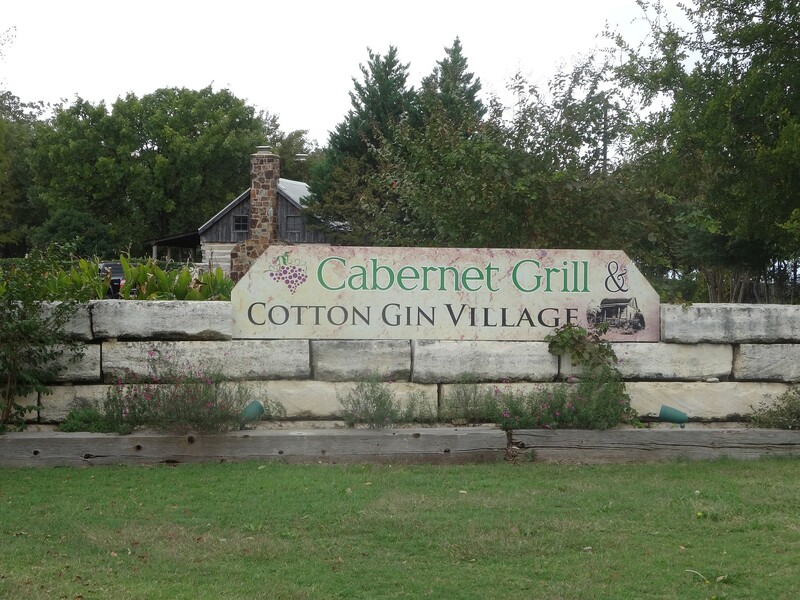 When you walk to the restaurant at the Cotton Gin Village, cabins are off to the right where you have the option to stay within walking distance of the restaurant. We have wanted to stay at the bed and breakfast, but have not had the opportunity until recently. 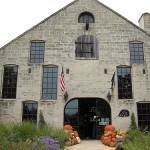 Most of the time when we have had the chance to stay at the bed and breakfast, they were already booked which shows you how popular the lodging is. 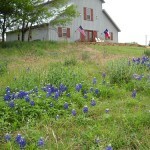 The last time we were in Fredericksburg was from a Sunday to Monday, and a Sunday night stay worked out perfectly! Unfortunately, the Cabernet Grill is closed on Sundays and Mondays which meant we could not enjoy a fantastic meal and just walk to our cabin. But we made do for dinner, and found our way to our cabin later that evening. 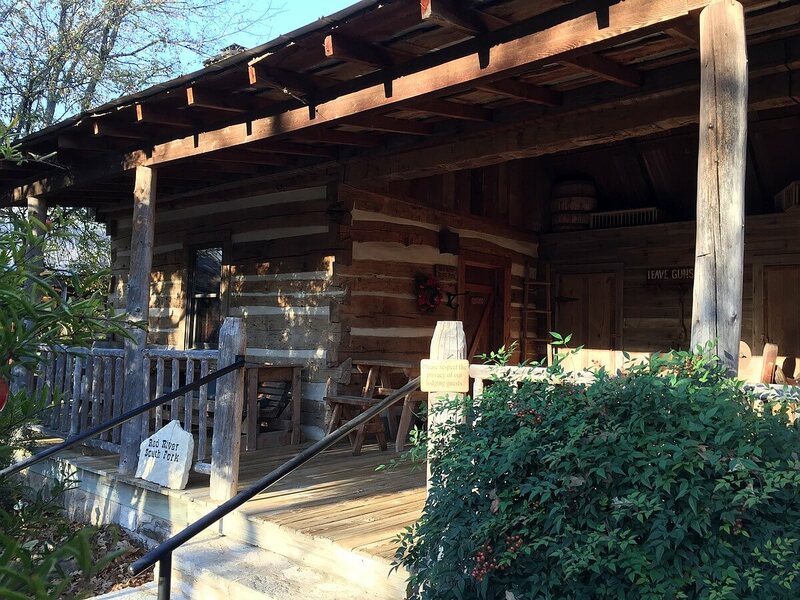 There are eight cabins at Cotton Gin Village and we had chosen the smaller Red River South cabin because it was just for the two of us. It was already dark, but we had no problem finding the cabin with the lights along the sidewalk. The lights were on inside the cabin, and we entered into a living room complete with fireplace (firewood is outside the cabin to use), and the bedroom and bathroom off to the side. 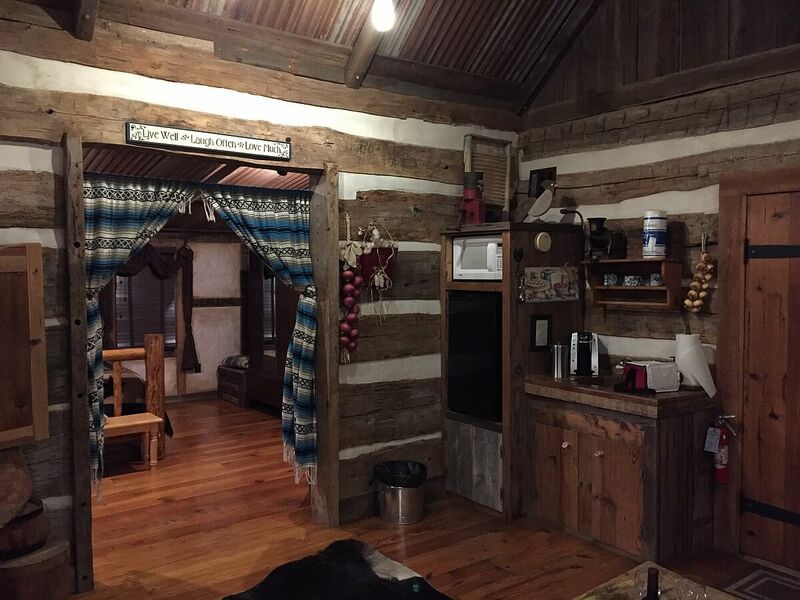 The cabins are designed as rustic log cabins, but the inside has all the amenities you would want for a stay. From cable TV, Wi-Fi, and stereo, all was available to enjoy your evenings. A small kitchen with staples are available such as a large selection of coffees, teas, and hot cocoa with a Keurig coffee maker. Also included was bottled water, microwave popcorn, and even the ingredients to make s’mores. It was chilly the evening we stayed, otherwise we would have enjoyed sitting outside on the front porch or perhaps in the courtyard where a fire was even burning, which would have been perfect to make those s’mores. The bedroom had a nice queen size bed and the bathroom had a corner Jacuzzi tub/shower. It really was a nice cabin to just relax. One of the upgrades you can purchase is a nice cheese and wine platter, and what better way to relax in the cabin, especially with a crackling fire in the fireplace. After a peaceful sleep in the cabin, we awoke to an expected chilly morning. 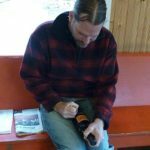 I had to get something from the car, and even though it was a little cold outside, it wasn’t unbearable. Have you ever noticed when it is cold outside how quiet everything is? While walking to the car, I walked by the waterfall fountain right in front of the entrance, and I could just stand there to watch and listen to it since it so tranquil. I did mention this was a bed and breakfast, right? 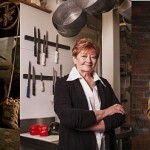 Almost 9 a.m. on the dot, breakfast is delivered right to your door and hung on an outside hook. 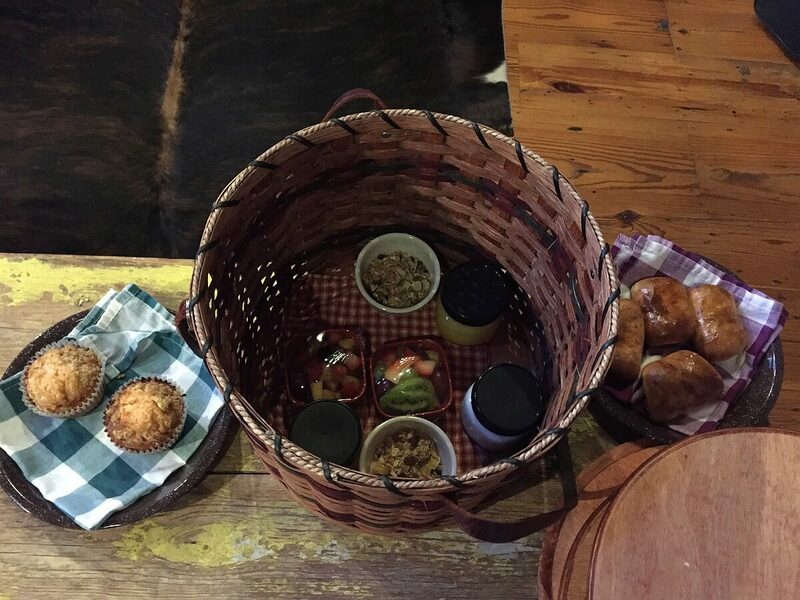 The breakfast arrives in a picnic basket with multiple layers inside holding the various freshly made hot and cold food items. The breakfast menu changes daily, but ours included hot kolaches along with muffins, fresh fruit, cereal, milk, and orange juice. Other types of items offered some days are super sticky cinnamon rolls, tasso ham quiche, breakfast tacos, and house flavored yogurts. 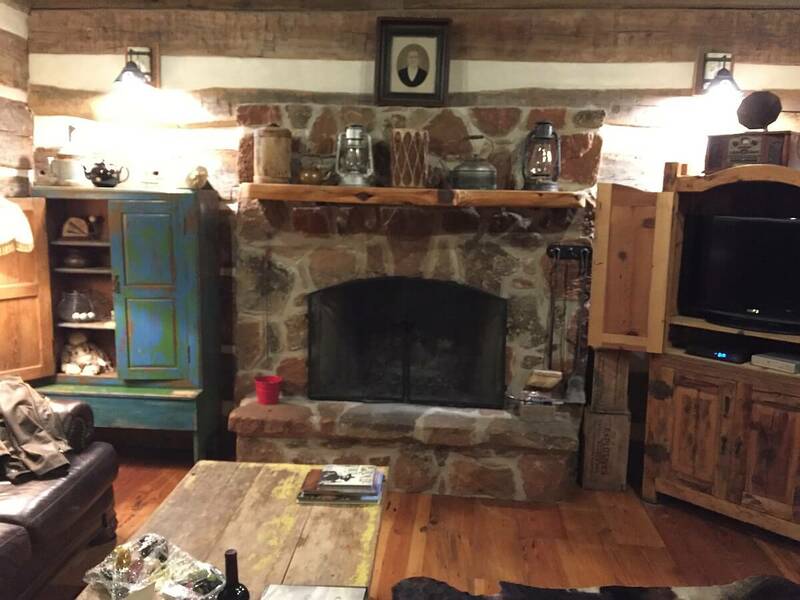 Overall, our experience staying at the Cotton Gin Village lodging was enjoyable, and we would definitely stay there again when we get the opportunity. 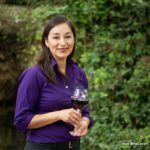 Since the location is just south of Fredericksburg, it would make a perfect base camp to visit wineries. 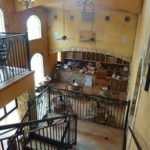 Add to that a romantic weekend along with the wonderful food at the Cabernet Grill, and you will end up having an excellent time in the Hill Country.